BEN NORTON: In India, violence against Muslims and people from lower castes is rapidly increasing. Some of this violence has been stoked by the government, which is ruled by the far-right Hindu nationalist Bharatiya Janata Party known as the BJP. Extremist mobs that followed the Hindu nationalist ideology, Hindutva, have organized violent gangs and repeatedly lynched Indians from minority groups solely because they were accused of selling beef. In June 2017, a far-right mob killed fifty-five year old meat trader, Alimuddin Ansari, in the eastern state of Jharkhand. 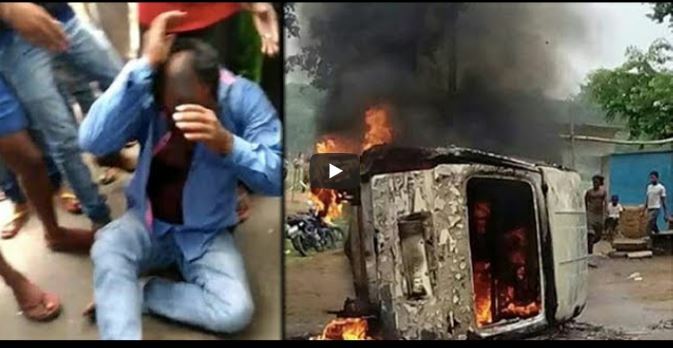 The extremists claimed he was selling beef, so they pulled Ansari out of his car, beat him to death in the road and set his automobile on fire. Massive protests were organized in response to the attack and eleven men were surprisingly sentenced to life in prison. Among the convicted was a politician from the ruling party, the BJP. This was the first time that extremists who carried out a cow-related lynching were actually convicted. However, a year after the attack the high court suspended the life sentences of eight of the killers, including the BJP leader. When these convicted killers were released, a powerful Indian state minister was there to meet them. The top BJP official, Jayant Sinha, honored the killers with candy and hugs. He even put garlands around their necks and posed for a photo. The senior government minister’s endorsement of convicted lynchers ignited a scandal inside India. The Real News spoke with journalist Sidharth Bhatia, who is a co-founder and editor of the prominent independent news website, The Wire. He responded to this shocking story. SIDHARTH BHATIA: Ever since a law was enacted in different parts of the country, every state, every province enacted their own law which made the position the consumption, the distribution and sale of beef, and specifically cow meat, illegal, because that’s the one very important platform for the current party, and it came into power in all these provinces. Ever since then, there have been a lot of lynchings, most of them based on suspicion. And I say lynchings because there have been other acts of violence, but this has been- this is the most extreme. BEN NORTON: And Jayant Sinha, The BJP Union minister who honored the lynchers, is far from an ordinary person. He is a prominent capitalist from an elite family. Sinha studied at some of the top schools in the United States, including the Harvard Business School and the Ivy League University of Pennsylvania. Sinha later worked at the prestigious global consulting firm, McKinsey and Company. He then served as the managing director and head of India Investments for the Omidyar Network, the investment firm founded by eBay billionaire, Pierre Omidyar. Sinha’s father, Yashwant Sinha, also previously served as finance minister in the former BJP government. The Wire’s Sidharth Bhatia spoke about Sinha’s elite capitalist background. SIDHARTH BHATIA: So, his father was a civil servant in the government of India, part of what is called the Indian Administrative Service, quite an elite service, very few people are chosen after a very vigorous entrance exam. And his father was in the IAS, and he came out. And eventually in the late 90s, joined the BJP, which came into power for the first time, and after a while was made the finance minister. His son went to various small schools and then moved to Delhi, where he went to a good school, after which he went to the Institute of Technology, which by the way is very, very, very difficult to get into. It’s one of those really elite engineering institutions. He’s got the kind of biodata which most parents would wish for their children. Then, he went then to the Indian Institute of Technology, then he went UPenn, then he went to Harvard. After Harvard, he joined McKinsey, he was at the hedge fund. And then he ended by joining the Omidyar Network and he was their representative in India. So, you can see. I mean, this is not merely elite. This is second generation elite, because his father himself was part of the elite civil services. So, he’s had the benefit of very fine education, and one assumes that this education, apart from teaching them about finance and management and engineering and technology, also teaches liberal values. One assumes that. I mean, nobody can hold a gun to an adult and make him do something which is totally against fundamental values. And your fundamental values, if they are challenged, you’re not going to turn around and say, “Let me go out and murder people or facilitate people who are murdered.” So, it’s very disappointing because it gives a certain kind of legitimacy to this kind of act. He has now regretted it, he has issued a statement. He first, after he did this, issued a series of Tweets in which he said- well, it was very mealy-mouthed, that he was following the law of the land, he’s against violence but there’s always room for another case and another hearing. It was all very, very, as I said, mealy-mouthed, and not really convincing. BEN NORTON: Bhatia stressed that it is this elite capitalist class that is the political base for the BJP. It is not working class movements, but rather upper class movements that are behind the drive for far-right Hindu nationalism in India.